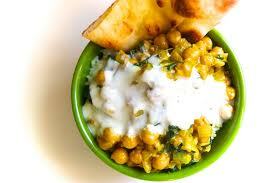 Firstly place chickpeas in a food processor or blender with 1 tablespoon warm water and process until finely chopped. Secondly with the motor running, pour olive oil in a thin, steady stream and process until smooth. Thirddly remove chickpea mixture from the processor and fold through yoghurt, coriander, salt and cracked black pepper. Later mix until well combined.